Bissett’s performance is brilliant as she flips between the present day and her teenage self. I am equally impressed by the supporting cast who play a variety of people that Bissett came into contact with, from managers to mates, each one multi-rolled with skill and depth. I am particularly impressed by Harry Ward who plays a hilarious, but at times touching, rendition of Bissett’s mother. The audience roar every time this character comes to play. The use of music places the play within a cultural context that many of us can relate to. Performing songs from her personal hero Patti Smith, as well as the likes of Nirvana and Sultans of Ping, I know that each choice will strike a chord with each audience member at different times. This is what makes the show so far reaching, Bissett has managed to tap into a generation that is intensely sentimental, whether they’d admit it or not. The short one-act structure means that the transition from ambitious teenager to present day feels slightly jarring. Nonetheless, the content of the latter half is of just a high standard. 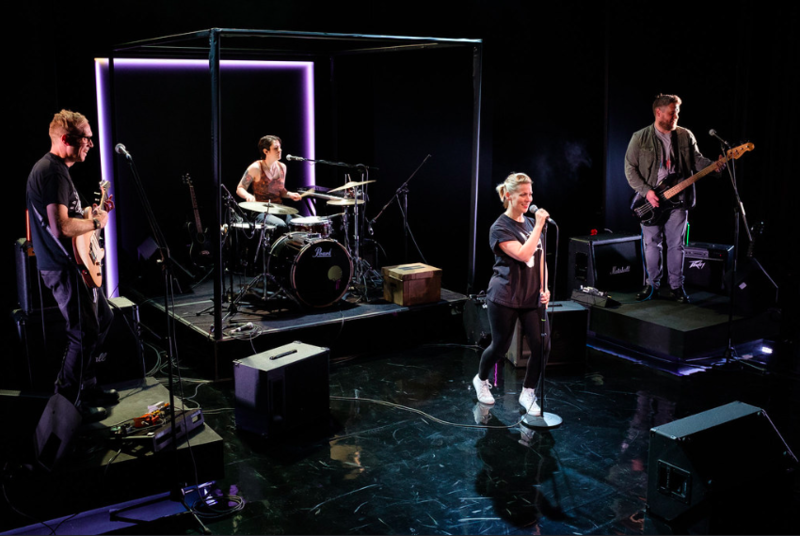 Exploring other themes that make a woman who she is-from love to loss and heartbreak- the pace slows only to bring you up again for the show’s upbeat and raucous finale. I find myself involuntarily whooping mid-scene as Bissett and the band perform the finale number, only to be followed by a well-deserved standing ovation. Review written by Rachel Baker.